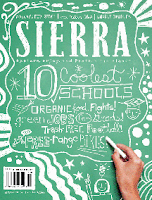 For those of you who will be helping your children look for colleges this year (or are planning on going back yourself), the Sierra Club has just released their third annual list of Cool Schools, a list of the top 10 greenest 4-year colleges and universities (the full list includes 135 schools). Apparently, according to a recent survey by Princeton Review, two-thirds of university applicants say that a school's environmental report card would influence whether they'd enroll. I must admit I was rather shocked by this statistic! Very cool. Since being environmentally friendly is becoming a larger and larger influential factor in the college decision making process, universities and colleges in the U.S. are doing their part to curb their environmental footprint, which isn't just good for the students but for the communities around them as well. These colleges and universities are integrating in programs like free bikes for students, organic gardens on campus, solar panels on buildings and the like. UC BOULDER??? yike. Last time I looked, it was the #4 Party School in the country; populated by rich kids all of whom owned their own SUV. Rob - Does Wazzu make any list for anything? :) I think they did have a small section on community colleges but I didn't really look at it. Greenpoppy - Boulder is the granola capital of the Midwest. Unfortunately, its students might be as you described. When my brother lived in Boulder (up until about 5 years ago), he said the "homeless teens+" with the dirty clothes and dreadlocks would hang around panhandling until after work time, when their parents would come pick them up in their Mercedes. It was quite laughable.